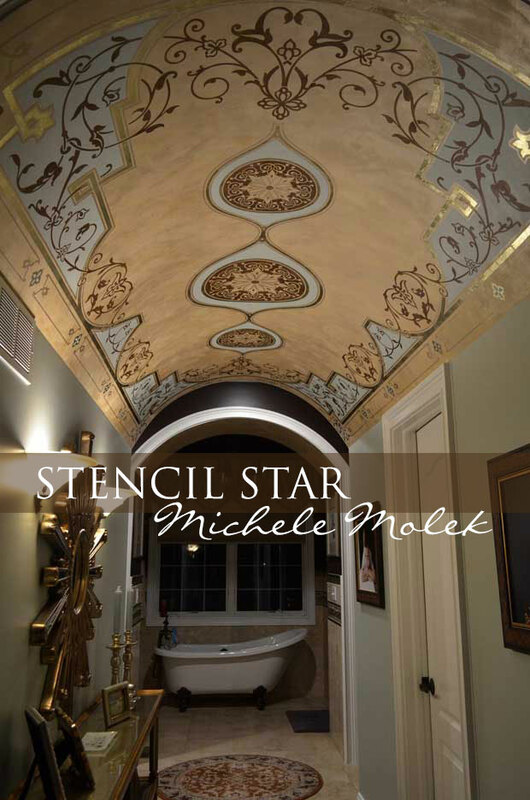 Creating innovative and showstopping finishes is a trademark of artist Michele Molek’s work. 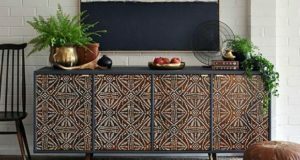 She frequently uses stencils with her finishes as well as the flexibility allowed by Modello® Designs to customize and size a pattern. The above, multi-colored stenciled ceiling features the Alhambra B Stencil from the Modello® Designs Carpets & Panels Collection with a gorgeous application by Michele in a dining room. 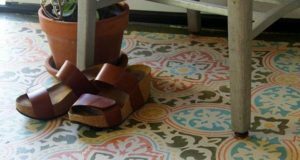 We travel to North Carolina to meet with the innovative and talented Michele Molek of Fashionable Finishes. 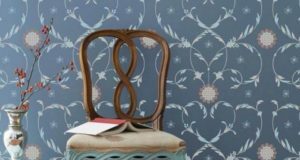 She frequently mixes beautiful decorative paint and plaster finishes with lovely ornamental patterns and stencil designs. 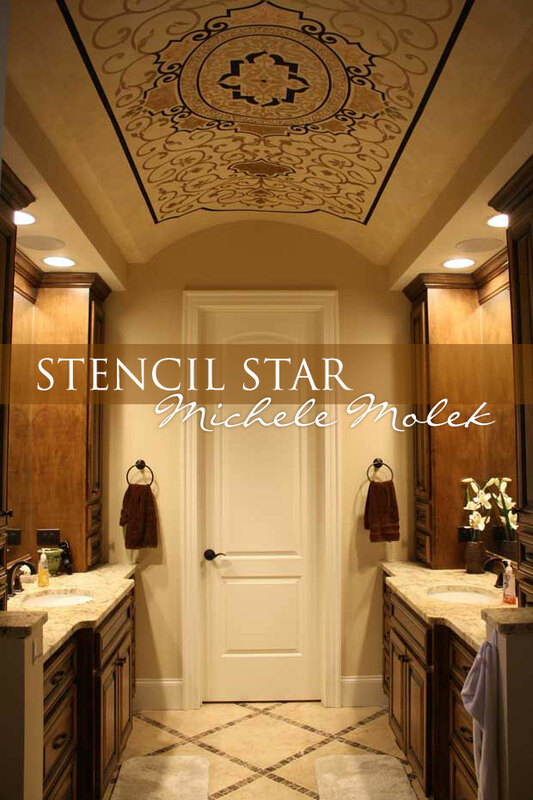 We’re proud to feature her in our Stencil Star™ series, which seeks to showcase creative artists and feature their inspired design and decorative painting projects using our Royal Design Studio Mylar stencils and Modello Decorative Painting Stencils. An over-sized graphic stencil pattern is paired with a shimmery strie plaster finish for striking results in a dining room. The outcome, just gorgeous! The pattern was a customized vinyl stencil by Modello® Designs. What draws you to Stenciling? 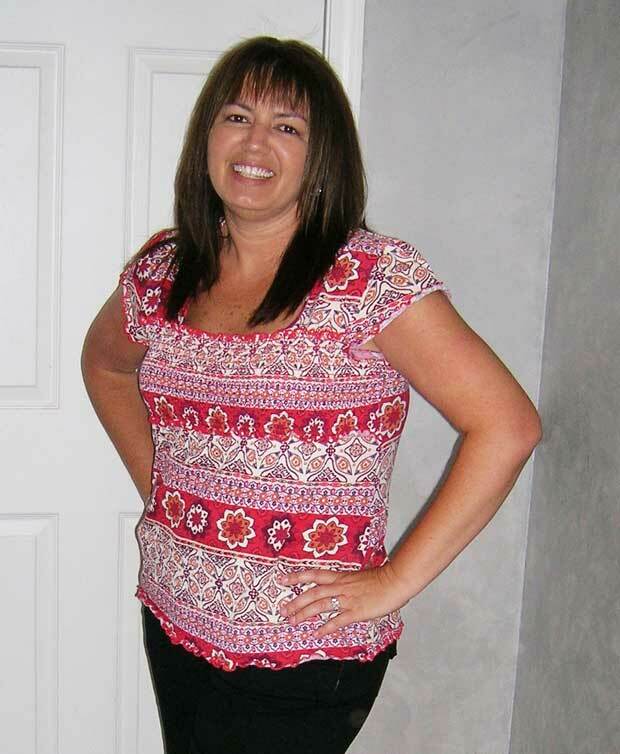 Michele was ecstatic to find the time to update her own home! After 10 hours with paints, stains and Modello® Designs Stencils, white stairs were transformed with a faux wood marquetry finish. Quick and dazzling! 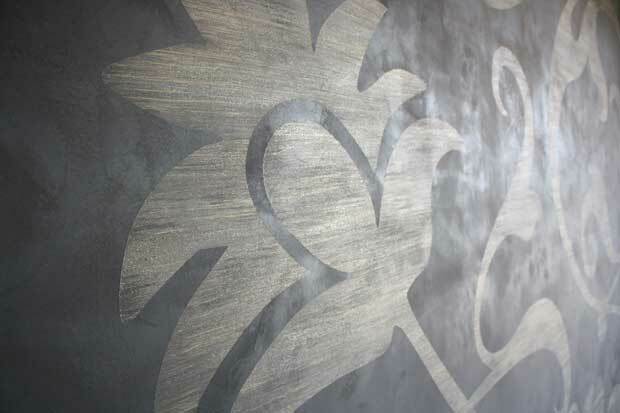 The Transitions Stencils from Modello® Designs allow for a seamless flow of color and design from one space to another. Here, the TransBor101 stencil pattern adds beautiful interest to architectural arched entrances. What are your favorite surfaces to work on? 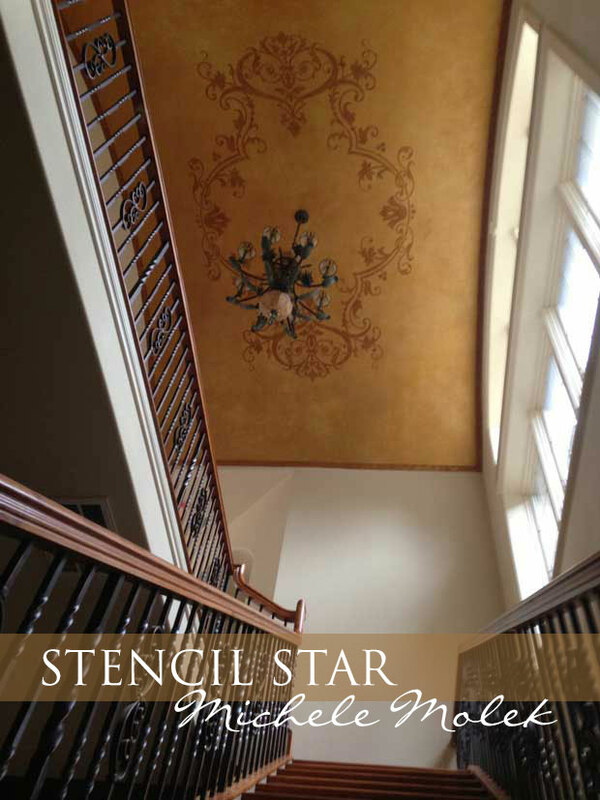 Gilding, layered plasters and multiple colors create a showstopping stenciled barrel ceiling. 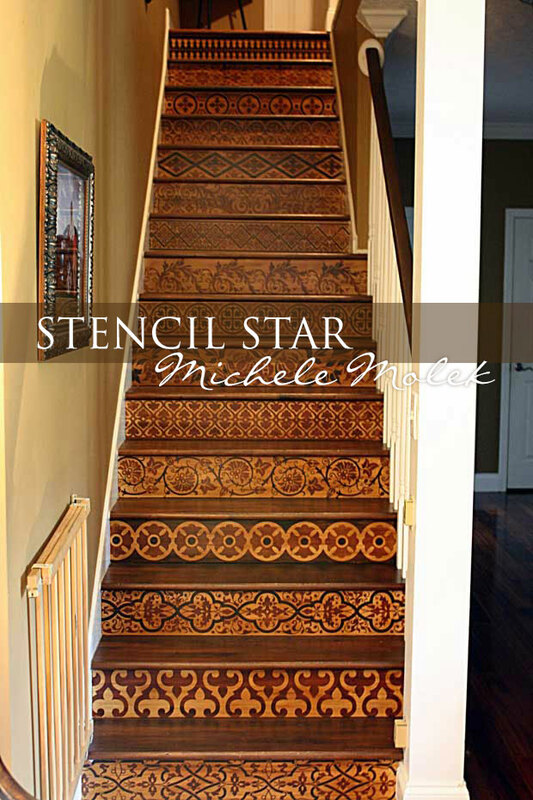 Michele used a modified version of the Modello® Designs Chateau CC 118 Stencil from the Carpets and Panels Collection. One of the most popular Modello® Designs Stencil is the Ornamental Center 162 Stencil from the Ornamental Stencils Collection. The pattern works perfectly around both small and large ceilings as well as helping showcase light fixtures beautifully. It looks like the perfect design for this foyer staircase ceiling. What would be your “dream” stencil project? 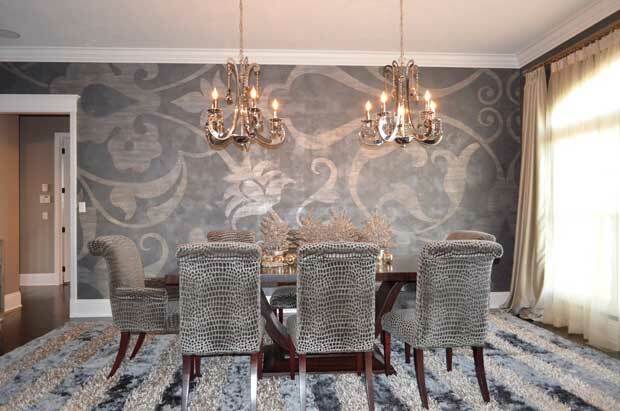 This stenciled wall finish features fire opal glitter and over 1,000 topaz Swarovski crytals. 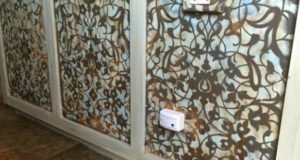 It’s an incredible wall application with an Ornamental Allover Stencil (OrnAll117). 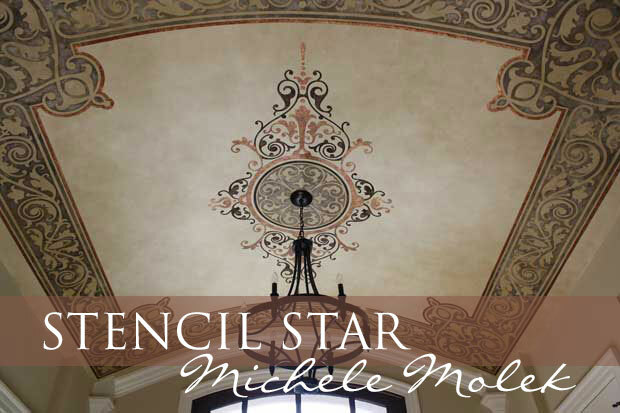 “Without your extraordinary product, this would never have been possible,” Michele says of Modello® Designs stencils. 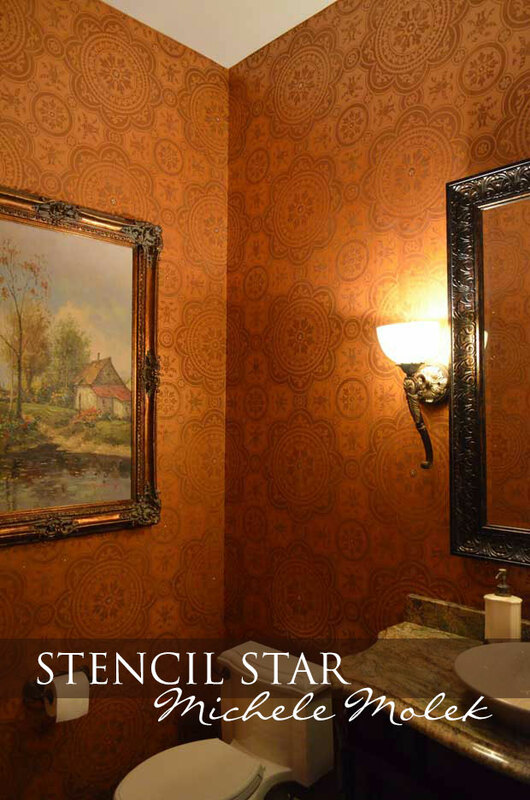 Elegant treatment on the walls and sophisticated stenciling on the ceiling – check! Michele uses her talents to achieve a harmonious color scheme with both the finishes and patterns in this luxe bath. 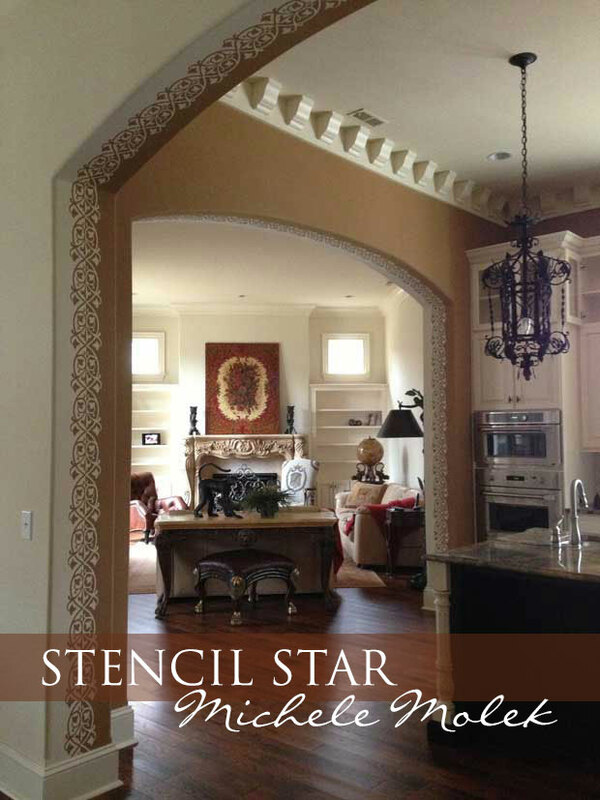 The ceiling pattern is the Exotic East Panel Stencil (EasPan152) from the Exotic East Stencils Collection from Modello® Designs. Michele Molek is owner and sole artist of Fashionable Finishes located in North Carolina. As a child and teenager she could always be found doing something creative – painting posters for the high school football team, making prom bouquets for her friends, or just redecorating her room over and over again. When college rolled around, instead of following her passion for art and design, she obtained a Bachelor’s degree in Criminology and a Master’s degree in Counseling Psychology. Following her high school sweetheart turned husband around the globe as an Army wife, Michele worked with military families and disable veterans in a counseling role for several years. Her first attempt at decorative finishing came in 1996 when she did a glazed finish in her own kitchen. 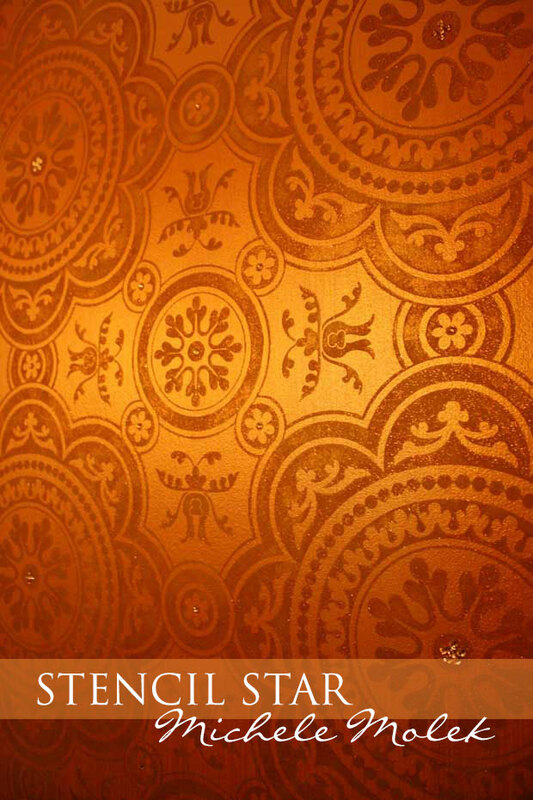 In 2003, a contractor visited her home and commented on her beautiful “wallpaper”. When he learned that it was a painted finish, the contractor encouraged Michele to think about doing it professionally. After taking a break from counseling and undergoing decorative paint training, she opened Fashionable Finishes in 2005. That fun break from counseling is now a thriving career. Be sure to keep up with her projects via the Fashionable Finishes Facebook page, too! I am very impressed with not only the beauty of the ceiling stencils, but the ceiling stencil-ers !! I have tried, in a small bathroom, and find it very hard to apply and paint the motivs. How does a person get the stamina and strength to manage in such an uncomfortable positioning? (Not the usual comment, but an enigma to me). The artists have my admiration ! A very good question, Eileen! Ceilings have their trials but when you are done, there is nothing else quite like the results. There must be frequent breaks, limited hours (if possible) and of course, having the right tools and materials — like the adhesive-backed Modello® Designs stencils Ms. Molek used — make all the difference. The pain does go away but the beautiful finish lives forever! Thank you for your reply. Just one more “enigma”…….how do you manage to apply the stencil in the first place. (Something about gravity) ! I still would like to give it a go, but it seems awkward to spray the stencil and then not have one end hang on your head, especially with the larger stencils. Thankyou. When I initially left a comment I seem to have clicked the -Notifyme when new comments are added- checkbox and now every timea comment is added I receive four emails with the exact same comment.Is there a way you are able to remove me from that service?Kudos! Hi! This is my 1st comment here so I just wanted to givea quick shout out and tell you I truly enjoy reading through your blog posts.Can you recommend any other blogs/websites/forums thatcover the same subjects? Appreciate it!